In past columns I've written about the use of on-line resources that make some aspects of family history research easier - as well as some on-line sources that need to be used with caution. In this column I want to address two relatively new tools that I have found to be useful in my own research. One of these is a new tool that LDS has recently made available through their www.familysearch.org web site as a "pilot" project for providing direct access to images of a potentially huge collection of source documents. The other is the expanding and better indexed collection of digitized books and other document collections available through the Internet. In several past columns I've used the example of the research involving my gr.gr.grandmother Amelia Stockman to illustrate different research mechanisms and the importance of investigating complete families rather than just individual direct ancestors in attempting to extend an ancestral line. Over the past several months I've found both the LDS "pilot" record search mechanism and digitized books to be invaluable in learning more about a specific group of Stockman families and in finally identifying the parents and siblings of Amelia Stockman. While numerous projects to digitize books have existed over the years, they have not always been easy to find or to search. Recently, the volume and extent of these resources has grown to the point that they need to be included in the resource list for anyone involved in family history research. Some such resources have been available for many years. For instance, in researching ancestors in Western Pennsylvania I've frequently made use of "Historic Pittsburgh" maintained by the University of Pittsburgh at http://digital.library.pitt.edu/pittsburgh Their introduction states that "Historic Pittsburgh is a comprehensive collection of local resources that supports personal and scholarly research of the western Pennsylvania area. This Web site enables access to historic material held by the University of Pittsburgh's University Library System, the Library & Archives at the Heinz History Center, Carnegie Museum of Art, Chatham College Archives, Pittsburgh History & Landmarks Foundation, and Point Park University Archives." A project by Google over the past several years has resulted in a large collection of digitized books that can be directly searched through their search engine at books.google.com Due to copyright limitations, many of these cannot be viewed in full text mode. But the ones for which copyright has expired can usually be read and searched in total. Often, these are the old local history books or compilations of other documents of historical significance that can be extremely useful in family history research. On the home page at www.familysearch.org there is currently a link labeled "See prototype for searching millions of records" - which links to pilot.familysearch.org On their web site FamilySearch states that: "In 2005, FamilySearch began to improve access to its collection by converting microfilm to digital images that could be searched online. The next step was to create an online tool that volunteers around the world could use to look at the digital images and extract relevant data that could then be published online in searchable indexes linked to the digital images." For those record collections that have already been added to this system you can view the actual images of such documents as old marriage records from Michigan, death certificates for some parts of Ohio, the original records for the 1900 census for most parts of the U.S. and 1850 & 1870 census records for some states. In addition, the extracted data is available for many documents for which the images are not directly available - including some German church records. For some records, such as the 1860 census, the extracted data is available and images can be viewed through a 3rd party site via subscription. All of these documents have been available in the past (and still are) on microfilm through the LDS Family History Centers. However, having them on-line, completely searchable, indexed, with viewable images of the original documents, is a huge step forward in making them readily accessible and useable. As this on-line collection grows, this will probably become an extensively utilized tool for anyone doing family history research. My previous column emphasized the importance of researching siblings of a direct ancestor as a way to learn more about how and where the family lived - and also as a way to find additional clues regarding their ancestry. I had previously identified one of the sisters of my gr.gr.grandmother - and had identified some other Stockmans who appeared to be related. Use of the above two research mechanisms, plus collaboration with a 4th cousin who had researched other Stockman families that turned out to be related, resulted in identifying the parents of Amelia Stockman as Justus Christian Stockman and Carolina Frederica Reiche. Dr. Stockman was a physician and druggist who had immigrated from Germany in 1794 and had married Caroline that same year in Philadelphia. He later had a practice in Albany, NY for about 10 years - then in Utica, NY for another 22 years before his untimely death in 1826. We learned much about Dr. Stockman and this family through excerpts from digitized books and through numerous on-line records, mostly in Michigan, available through the new FamilySearch tool. In researching my gr.gr.grandmother, Amelia Stockman and my gr.gr.grandfather Robert Nicol, we had previously found considerable information about Robert's ancestry in Scotland, about their children, and about Amelia after the death of Robert in Michigan in 1850. However, there was a big gap in our knowledge prior to 1850. A breakthrough came in the discovery of two different biographies of one of their sons in old Montana history books that had been digitized and were available on-line. In addition to providing more information regarding the few years after Robert's death, one of the bios stated that Robert had immigrated from Scotland to Newark, NJ and that he married Amelia there in 1830. That was a critical clue, since the only Stockman family in Newark in 1830 was the family of Caroline, widow of Justus Stockman. My 4th cousin, Jack Stockman, knew enough about that family so that we knew where to search for more data. Marriage, birth, and census data from Michigan and Ohio obtained fairly efficiently through the new FamilySearch tool helped to identify several other members of the family. Also, a digitized history of St. Louis identified another sibling of Amelia. 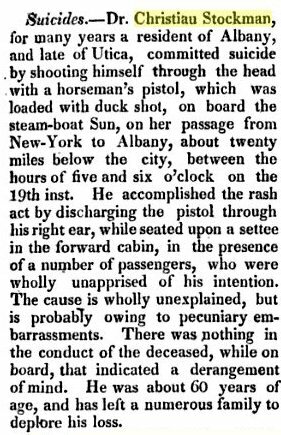 And, ultimately, I found a biography of Dr. Christain Stockman in a digitized history of the town of Utica, NY before 1825. From this and several other digitized references to him we learned much about him. The biography and other references helped explain this event. While Justus Christian Stockman was well respected in his profession and, apparently, doing well financially, he believed that he could make a significant amount of money by conducting a group of Native Americans on a tour of Europe. This endeavor failed - and he lost all of his investment in that enterprise - which left him broke and dispondant. His resulting suicide left his family in very difficult circumstances. Caroline and most of the children went to New Jersey to live, temporarily with her oldest married daughter. Over the next few years the family scattered quite a bit, with several of them ultimately ending up in Michigan and northwest Ohio - and with Amelia and her sister Ann Eliza Fox ultimately ending up in Montana. Prior to the availability of the two research mechanisms addressed in this column it would have been very difficult and time consuming to find the pieces of this puzzle and make a reasonably coherent picture. There are still some missing pieces of information that will need to be located through other means, such as searching LDS microfilms to make a complete picture. Perhaps these tools will be of use to you in your own family history research.